The actor holds his charitable endeavors higher than his acting accolades. 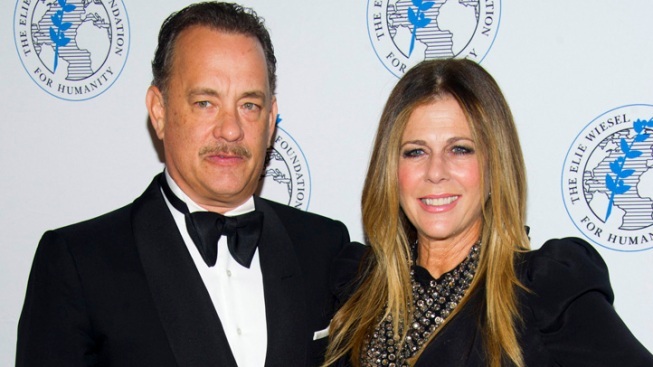 Honoree Tom Hanks and Rita Wilson attend The Elie Wiesel Foundation For Humanity's Arts for Humanity Gala. When two-time Oscar winner Tom Hanks found out he was being honored by the Elie Wiesel Foundation for Humanity at the New York Public Library, he remembered he owed a couple of books. "I've got to turn them in from 1977," Hanks said on the red carpet before going into the gala event. Hanks, accompanied by his wife Rita Wilson, joked that when he got the call from the foundation, he responded, "No, this is the Hanks house," followed by "really" and "why?" Hanks posed on the red carpet with Wilson, his son Colin, of "Dexter" fame, and Wiesel too. Hanks' consistent thoughtfulness and concern with his charitable endeavors earned him the honor. He holds it higher than his acting accolades, but also realizes that the two are connected. He's proud of the work he does, and by virtue of being in a few successful movies, feels that put him in a position to be altruistic. "We work very hard in a business that deserves and earns every bit of ridicule that we heap upon it. But at the end of the day you got to wake up in the morning and try to make the world a better place," Hanks said. The 56-year old actor says that's the way he was raised. "We're American, and Americans take into account the common good. So in that regard, I feel very lucky and very blessed that I've been able to do that, when I've been able to do that," Hanks said. While Hanks says he recognizes the importance of philanthropic work, he feels that arts education still needs government support. "I believe any form of government, particularly ours in the United States of America, has been over and over again this engine for social change in a magnificent way when it gets around to doing the right thing. And right now, I think we're putting a lot of emphasis on the idea that philanthropy can take care of everything, which is not the case," Hanks said. He feels it's up to elected officials to understand the good things that the arts can do for the future of our country. "Sometimes that's the arts, and sometimes it's other things like taking care of folks that don't have any way of fixing their teeth. That's not bad, either," Hanks said.